A romantic dinner is a chance to dress up, a chance to be together without interruption where you get to relax, eat, chat and flirt. This means that when Valentine’s Day comes around on 14th February, a romantic dinner is a perfect Valentine gift for men, where the two of you can focus on each other. Here are some tips to create the perfect dinner to celebrate the day. We all lead busy lives, and it is easy to get caught up in talking about work, the children and other challenges of daily living as you eat. Make this meal different with food that makes you interact, with both the food and each other. Suggestions include a fondue or fajitas where you create your food as you go and do more than just lift a fork to your mouth. As well as being fun, it means you spend longer dining, giving you more time for conversation. The Food Show, due to be held in Christchurch from April 8 to 10, 2011, has been postponed until later in the year due to the tragic events of the February 22, earthquake. The Food Show venue, CBS Canterbury Arena, has incurred only minor damage but has ceased operations until March 15. Organisers of The Food Show, North Port Events, will talk with the venue after that time to confirm new 2011 dates. “We all feel deeply for the people and businesses of Christchurch as they struggle through this terrible disaster,” says North Port Events CEO Dona White. “While we completely understand that holding the show in April is not possible for so many reasons, we believe that staging it later in the year could offer the people of Christchurch a much-needed pick-me-up once the situation has stabilised”. With more than 13 million adults and one in four children overweight in Australia, the Dietitians Association of Australia (DAA) is encouraging Aussies to jump, skip, hop and munch their way into the new year with the fourth annual Australia’s Healthy Weight Week,January 23 to 30, 2011. Under the theme ‘Live your Life: Weight Matters’ Australians will be encouraged to embrace a healthier lifestyle to avoid obesity-related lifestyle diseases. The week aims to raise awareness of how to achieve and maintain a healthier weight, through nutritious food and regular exercise. And the campaign will focus on practical tips for eating well, highlighting how this can help delay or prevent conditions like diabetes and heart disease. DAA has Accredited Practising Dietitians available for interviews to discuss the initiative and its importance for Australians. The record attempt will begin on Wednesday, February 16 at 1am EST, when the Oreo Facebook community of 16 million fans from around the world will have 24-hours to “like” a post from the cookie brand. Per Guinness World Records rules established for this category, Oreo fans will have to rally a minimum of 45,000 “likes” to earn the title and become the World’s “Most Liked” Cookie. 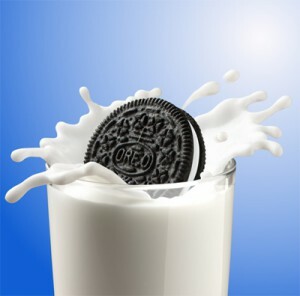 If successful, Oreo will become the first brand to hold a Facebook Guinness World Records title. Oreo currently has the third largest Facebook community of any brand in the world. Three per cent (120,928) of the entire population of Sydney belong to the cookie’s Facebook page with 387,906 Australians across the country belonging to Oreo’s Facebook page. To participate in the Guinness World Records attempt or for more information on Oreo, visit www.facebook.com/oreo. Choice Magazine recently released an article unveiling the unsettling realities about some supermarket practices in Australia. • Chilling beef mince extends the storage life to 44 days and cuts of lamb to 112 days. • Vacuum-packing with carbon dioxide and nitrogen. Carbon dioxide inhibits growth of micro-organisms and nitrogen is an inert filler. • Carbon monoxide is introduced to react with the myoglobin in the meat to produce a healthy-looking red colour (especially when it is no longer fresh). It is important to note that longer shelf life is linked with the increased likelihood and danger posed by some bacteria. When it comes to meats, there are advantages to shopping local. Butchers at your local municipal market, including those from Prahran, Queen Victoria and South Melbourne markets, still prepare and sell meat as you would expect to receive it – fresh, chemical free and natural in colour. Some even employ practices inherited from generations before them. For example, Sean from Kirkpatrick’s Meats at South Melbourne Market (pictured), works from whole carcasses and grows the lambs they sell at his farm near Echuca. Therefore it is as little as a few days between when the meat is slaughtered and when it is available at his market stall. World Pistachio Day is almost upon us, so this February 26 why not take a moment to reflect on this amazing little nut? Pistachios contain just three calories per nut, as well as more than 30 different vitamins and minerals? There is also evidence that humans were tucking into delicious pistachios as early as 7000 BC. Today the whole world is nuts about pistachios and nearly half of California’s 400 million pound annual crop of pistachios is exported. Israelis are the biggest fans of the nut with seven million snackers consuming nine million pounds of pistachios, making it the leader per capita for pistachio consumption. In many cultures the pistachio also has great symbolic significance. In China, it is known as the “Happy Nut” because it looks like it is smiling and pistachios are also given as a gift for good fortune at Chinese New Year. Whilst Russian legend also notes that anyone who hears the crackle of an opening pistachio nut will soon find success. Hillier’s Chocolates fans prepare for takeoff, The Qantas network have teamed up with Australia’s Oldest Chocolatier, to produce chocolates for Christmas holiday travelers this year. Hillier’s will be bringing festive treats to an airplane near you this Christmas with their milk chocolate Santas on all domestic, international and some codeshare flights in the week leading up to and including Christmas. Hillier’s chocolates will be available on all domestic and international Qantas flights between December 24 and 26 and on JAL flights on December 24 and 25. Ken and Kylie White were keen to diversify on their rural property just outside the small town of Dunedoo 325kms north-west of Sydney but it’s quite probable none of their family or friends thought they would become passionate about hens. The couple (pictured with their son Charlie) were, and still are, Hereford breeders on their 900ha property “Tanah Merah” but they realised that producing eggs would be less impacted by drought than their other agricultural activities. “We were wholly and solely a cattle operation but we wanted to diversify without any great capital expenditure. When we had the opportunity to acquire an existing egg production business, we grabbed it,” says Ken. He and Kylie purchased Farmer Brown’s Pastured Eggs from founders Tony and Margot Wentworth Brown of Snake Gully Dunedoo last August. The Farmer Brown’s Eggs were selling like the proverbial hot cakes through Sydney epicurean landmark store, Accoutrement. “The couple that started the business were selling the eggs through Accoutrement as well as in several outlets in the Blue Mountains and in Mudgee. It was a thriving business but we’ve expanded distribution slightly, selling through several more outlets in Sydney, including Feather & Bone and a couple of bistros,” Ken told OnFood. Kylie and Ken have about a thousand laying hens currently. The breed is Isa Brown – “most of the chooks the big egg producers have are hybrid varieties that are voracious layers,” Ken says. He describes the business as exceptionally labour intensive. “We spend a couple of hours every afternoon collecting the eggs and processing them which means cleaning them and packing them into the coolroom. “The reason these pastured eggs are expensive on the shelf is because the work can only be done manually. For example, you can’t wet the eggs so they are ‘dry cleaned.’ If the eggs are visibly clean, we don’t need to clean them further so a lot just need to be checked for cracks and then packaged,” he explains. The hens are watched over by three Italian Maremma guard dogs. These dogs were traditionally bred to guard sheep but will bond with any creature they are introduced to at an early enough age. Kylie told OnFood the new venture had proved to be reasonably plain sailing thus far. “We raise our chickens from one day old and that has proved to be a little bit of a challenge because of our climate – it’s very cold in the winter and very hot in the summer,” she says. She says an American farmer, lecturer and author, Joel Salatin, had pioneered the raising of chickens in mobile sheds which is what she and Ken are doing on Tanah Merah. “He raises livestock using holistic methods of animal husbandry on his farm in Virginia. He’s all for producing food locally and consuming it locally so he’s a bit of a guru,” she told OnFood. There is a huge demand for the eggs in Sydney. “We’ve got a waiting list of outlets wanting the pastured eggs but we can’t increase distribution right at the moment,” Kylie says. Ken says that when he took on the business, they both thought it would be quite an original venture. “But we have found quite a number of people doing the same thing – running about 300 to 1000 chooks, usually husband and wife teams, and the reason is there’s very strong demand for pastured eggs. “While the eggs are considerably different, there’s a strong animal welfare issue as well. The hens are completely free. They are never locked up, day or night, and people like that idea,” Ken says. “We don’t market our eggs as free range and that’s where the waters become a bit murky. We can’t feed the world with this sort of egg production – there aren’t enough people to do it – so there will always be some sort of factory farming. The bigger retailers can use the term free range but free range can mean 50,000 hens running on one hectare and it would be so unpleasant because one hectare becomes a mud bath. At the moment, the law says I think that 20,000 hens can run on a hectare and that’s outrageous. “The people doing what we’re doing have cottoned onto the Joel Salatin term, pastured. About 50 per cent of the pastured hen’s diet would be grass and bugs and they have a supplement of grain. And the nutrients are eight times higher than a cage egg so the health benefits are terrific,” Ken says.